I feel like I won a sort of unspoken prize today. I tricked my kids into thinking that cleaning toilets is cool, while at the same time, I taught them about science. Eco-friendly toilet cleaning? All the cool kids are doing it. I feel like it’s okay for me to write posts like this, because most days I am setting the kitchen on fire or feeding my kids processed foods or letting them watch too much TV. Keep in mind the context of my general parenting when you read my first statement. I’m writing this because you too can have a superstar moment in the middle of just surviving the whirlwind of being a toddler mom. I gave each of my boys a cup with some baking soda and asked them to sprinkle it in the bowl part of the toilet, avoiding the water if possible. (With toddlers, it won’t really be possible.) Then I gave each boy a cup with a little white vinegar and had them sprinkle that on top of the baking soda. And…boom! I might have talked this up a little bit by saying it would explode. But it did foam up and then the boys took turns scrubbing. As far as the science, I went pretty simple. I told the boys that baking soda is a base, vinegar is an acid. When they come together: BOOM. (That’s the scientific term I used.) We talked about chemical reactions and then that was about it. Because they’re five and three. You can go online and find much more information if your kids are older or if you are interested. I actually looked at more because I realized that I couldn’t remember what it meant if something was basic or acidic. So even I learned something. Toilets: cleaned. Money: saved. Environment: has a few less chemicals. Have you found any great cleaning tricks for home? Or found easy ways to get kids involved in household chores? This is actually kinda brilliant, I must say. It’s kind of hilarious because now I’m starting to remember all the “activities” my mother had my sister and I do which in reality were cleaning chores in disguise. I totally just thought of this whole tricking-the-kids-into-cleaning-while-also-teaching-them thing, and think I need to get a patent. Except I guess moms have been doing it forever. 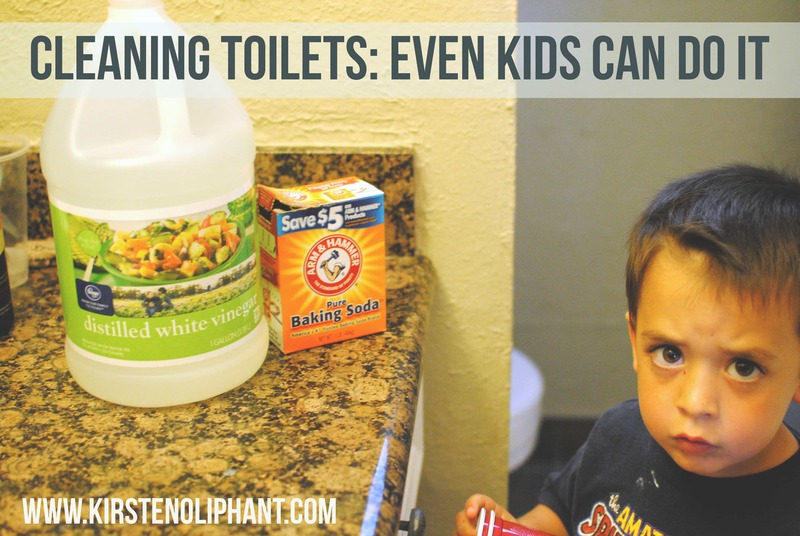 How about a clean bathroom cleaned by little kids? It’s like a perfect storm. Or a sharknado. I just love the look on his face. He was a little terrified. But then he loved it. They asked to clean the other toilet. For real. I wonder if it would work on my husband….he likes when things explode too!